To ensure that it preserves the quality of life for residents while accommodating the demands of an expanding population, Placer County began using GIS in-house to iteratively evaluate the impacts of various land-use scenarios. In 2016, Placer County had the second-highest increase in population among California’s 58 counties, according to the California Department of Finance. The county’s diverse economic base includes a mix of manufacturing, high-technology, retail, and business services companies. This has supported the strong population growth the county has experienced for more than a decade. For the period between 2003 and 2013, it was the fastest-growing county in the Sacramento region with a population growth of 26 percent. 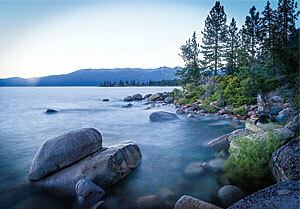 Placer County, California, is a vast county that covers 1,506 square miles. It extends from the agricultural region of the Sacramento Valley through the Sierra Nevada mountains to scenic Lake Tahoe. Because of Placer County’s appeal as a place to work, live, and play, it has become one of the fastest-growing counties in California. The need to supply services to this growing population continues to be the major focus of Placer County’s land-use planning strategies. Placer County routinely performs financial analysis for future development. This analysis of revenues and expenditures evaluates the financial impacts of land use within developments or specific plans. County officials evaluate potential revenues, such as property or sales taxes, provided by a development. That figure is balanced with county expenditures resulting from the development for public safety, general government, roads, and other costs. Historically, Placer County has relied heavily on consultants to perform this type of analysis along with the multiple revisions that are sometimes necessary. As with most development projects, land-use projects go through changes during the planning process. Placer County needed a more efficient and cost-effective way to analyze changes and perform financial impact analysis in-house and in real time. 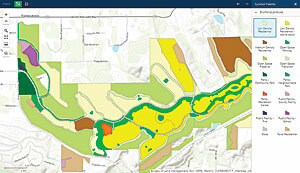 Non-GIS professionals at Placer County use GeoPlanner to draw and paint different land-use scenarios. Placer County acquired GeoPlanner for ArcGIS to assist it in performing financial impact analysis. GeoPlanner for ArcGIS empowers users to plan, test, and evaluate city, regional, and landscape-scale scenarios in a collaborative, iterative environment. 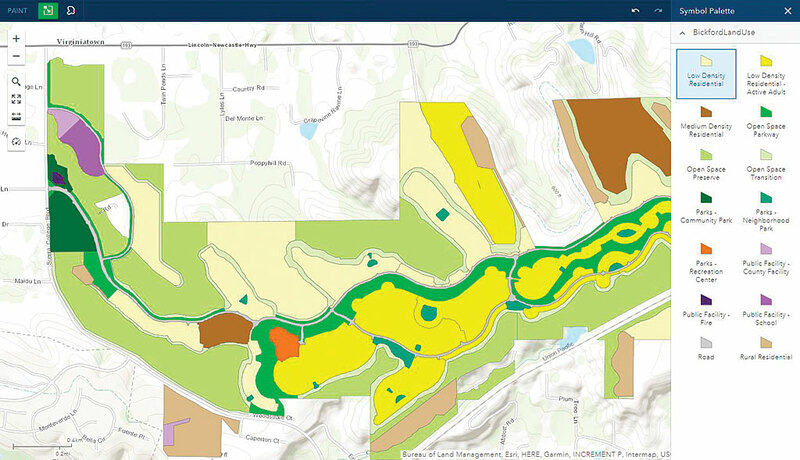 A web-based planning tool, GeoPlanner lets Placer County apply geodesign principles and uses data on intact areas from the National Intact Habitat Cores database provided by Esri to identify green infrastructure and preserve it. GeoPlanner can provide a more complete understanding of how an area performs or behaves. Once a project is created in GeoPlanner, other users in the organization are invited to collaborate and become part of the project team. As team members, they can access and work with project scenarios by sketching and drawing using symbols and drawing tools. GeoPlanner dashboards display qualitative and quantitative information about the scenario under consideration through information on key performance indicators (KPIs) displayed in easy-to-read gauges and charts that provide immediate feedback on design decisions by visualizing their impacts in real time. The impacts of multiple KPIs can be tracked at the same time the advantages and disadvantages of scenarios can be evaluated to aid in balancing multiple competing priorities. Using GeoPlanner, Placer County can run spatial analysis on the fly, compare scenarios, and produce data-informed plans using the real-time dashboards and KPIs. This helps county government staff and stakeholders understand the quality, performance, and impact of plans as they are designed. Placer County uses KPIs to model the financial impacts of different land-use scenarios. Using the KPI Report, the county explores many scenarios by measuring their effects on KPI values. In its comparisons, Placer County uses metrics that include estimates for residential units, population, jobs, areas of different land use, areas of commercial developments, revenues, and expenditures. Non-GIS professionals at Placer County use GeoPlanner to draw and paint different land-use scenarios. As planners and analysts change land-use patterns—such as from low- to high-density residential—KPIs immediately reflect changes in revenue and expenditure estimates. Placer County’s GIS group uses GeoPlanner to develop the layer of base land use and build out the KPIs. “Using GeoPlanner, we see and understand in real time the financial impacts of land use change on a project,” said Kelly Berger, Placer County GIS coordinator. “As land use changes in the plans, GeoPlanner helps us explore the greatest cost benefit to the county and its citizens,” Berger said. Placer County can look at key performance indicators (KPIs) displayed in easy-to-read gauges and charts that provide immediate feedback on design decisions by visualizing their impacts in real time. As Placer County continues to grow, decision-makers can further analyze and understand the financial impacts of development. Through the iterative process of developing a land-use plan, GeoPlanner helps Placer County contain costs each time the analysis needs to be performed. See Local Officials Ride the Wave of Baby Boomers in the Summer 2011 issue of ArcUser to read more about Placer County’s use of GIS in planning.